Delving beneath the surface of Minecraft will soon reveal expansive underground areas. The next update for Minecraft is going to be a big one. Creator Markus "Notch" Persson dubs version 1.7 of the game the "Adventure Update," but has been surprisingly mum on its contents. We all knew he wasn't going to be able to keep that up for long. 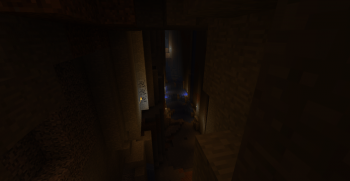 Persson has revealed that one of the additions coming in Minecraft's Adventure Update will be huge underground areas. He posted on Twitter: "Keeping 1.7 secret is frustrating and hard work. I feel a constant need to spoilerize. Anyway, I added underground ravines." He also released a screenshot to accompany the spoiler, showing a gigantic underground cave complete with pools of water and torches. Digging downward in Minecraft sometimes revealed smaller areas filled with lava and whatnot, but nothing like this. It's a hint that the Adventure Update will incorporate big surprises that might make it more worthwhile to explore the world of Minecraft. Don't be surprised if venturing upward also reveals something new. Minecraft version 1.7 does not have a release date yet.